Samuel de Champlain, though probably born a commoner, moved beyond his modest roots in the town of Brouage, France to become one of his country's most noted explorers. The acknowledged founder of the city of Quebec and the first European to discover the lake that bears his name, Champlain led expeditions deep into areas that would later be known as New York and Ontario. Champlain first traveled to North America in 1603, after establishing a reputation as a skilled navigator in expeditions to the West Indies and Central America. He spent three years in Acadia, a region in what is now Nova Scotia. Champlain took part in several summer journeys around the area to find a suitable spot for a settlement, but, as the months dragged on, many of his compatriots died during the biting cold winter seasons. His explorations led him as far south as the Massachusetts Bay, mapping areas that English explorers, who would land there in 1607, hadn't yet touched. In 1608, Champlain and 32 colonists founded what would later become the city of Quebec. Of the group, only nine survived the brutal winter to welcome new settlers in the spring. But trade alliances with native tribes led to prosperity and Champlain's Quebec colony flourished. After three years in France, Champlain returned to Quebec in 1613 and organized missions to bolster the sagging French fur trade and further his own explorations. He led a group of Huron-Algonquin warriors in an ill-fated attack on an Iroquois village, but ceased his adventures in 1620 after the King Louis XIII ordered him back to Quebec as an administrator. 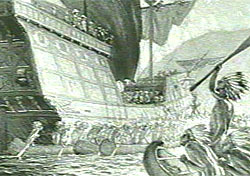 When Quebec was overtaken during a war with the British in 1628, Champlain was taken to England as a prisoner. He was released after arguing Quebec's surrender to the British had occurred after the war between the two countries had ended. England returned Quebec to France in 1632 and Champlain returned a year later. Champlain died in Quebec in 1635.